Jane Bocock (left) is a Clinical Nurse Manager specialising in neo-natal nursing in Taranaki. 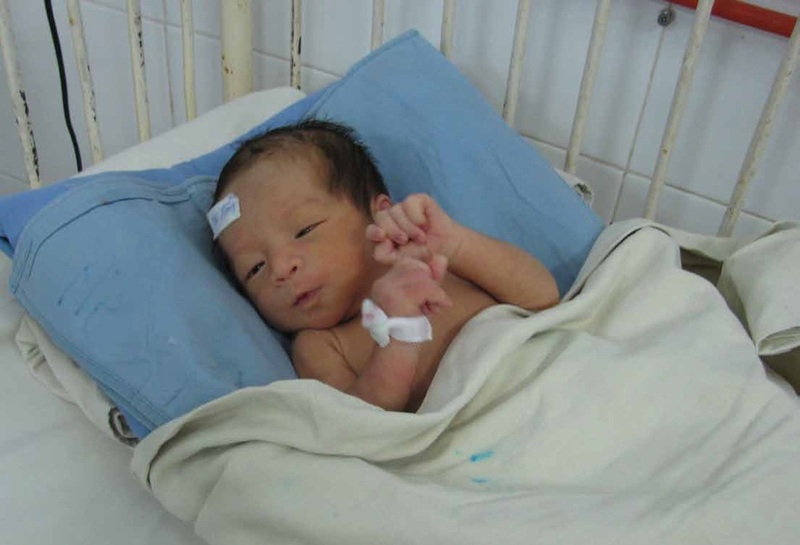 Over the past 13 years she has been a volunteer for the New Zealand - Viet Nam Health Trust, travelling to Bin Dinh Province to assist with the development and improvement in their neo-natal care. 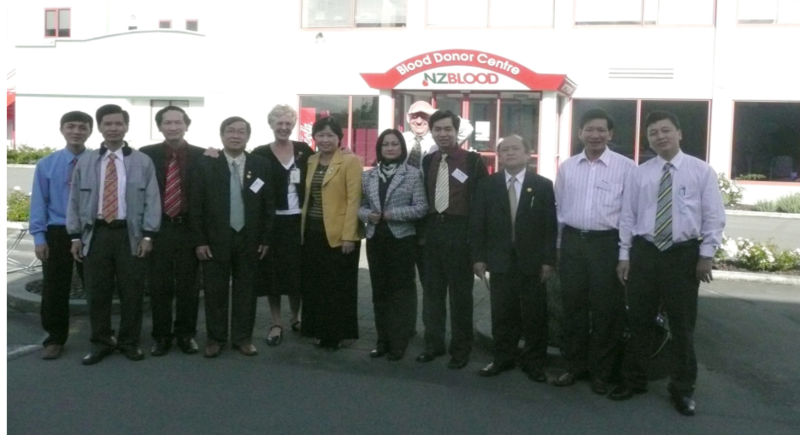 In March 2013, the New Zealand Viet Nam Health Trust hosted four Vietnamese surgeons from Qui Nhon in a surgical training exchange with hospitals in Dunedin, Rotorua and Auckland. 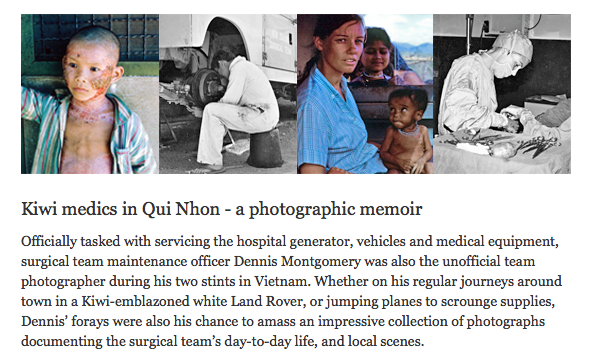 In this story, former civilian surgical team member David Morris, and army medical unit surgeon Brian McMahon, reflect on their work during the war, and talk about their ongoing relationship with Qui Nhon through the NZVHT. Surgeons Dr Viet Vo Van and Dr Nhan Phan Tran Dai (pictured) from Quy Nhon Rehabilitation and Orthopaedic Centre in Central Vietnam spent six weeks in New Zealand attending theatre and surgical consultations in Auckland, Nelson and Dunedin hospitals from February to April 2011. 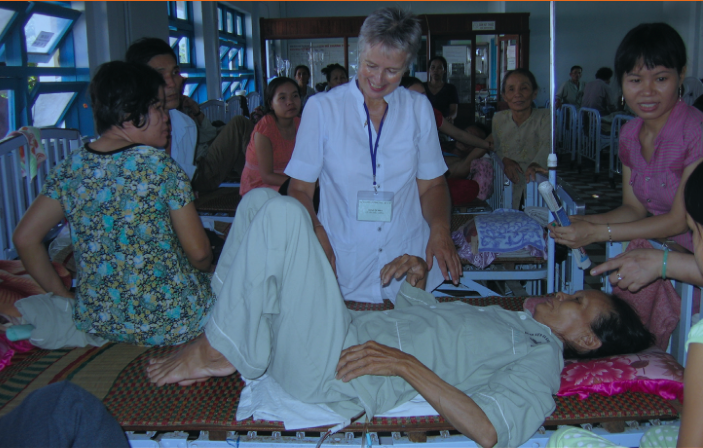 The Quy Nhon Rehabilitation and Orthopaedic Centre is a relatively small hospital that fulfils a unique role in providing treatment for disabled children, especially those with cerebral palsy, whilst also providing care for adults with mostly trauma induced disability. In 2011, the Centre was upgraded and rebuilt into a larger hospital, creating the need for an exchange whereby local surgeons could learn advanced surgical techniques that could be employed to improve their practice at the refurbished Centre upon their return. During their time in New Zealand, the Vietnamese doctors observed complex operations such as hip and knee replacements, the treatment of rotator cuff injuries of the shoulder and anterior cruciate ligament reconstruction. They also gained an understanding of the role of physiotherapy in rehabilitation and more broadly the organisation and operation of orthopaedic departments and outreach clinics within New Zealand hospitals. The visit was a continuation of an ongoing relationship between New Zealand and Vietnamese surgeons, coordinated by the New Zealand Viet Nam Health Trust. Brigadier (retired) Dr Brian McMahon is awarded the title of Anzac of the Year 2011 - click here to read the full article and click here for a related article by the New Zealand Defence Force. An assignment to improve and develop nursing services in Viet Nam’s Binh Dinh Province was a steep learning curve for one New Zealand nurse. 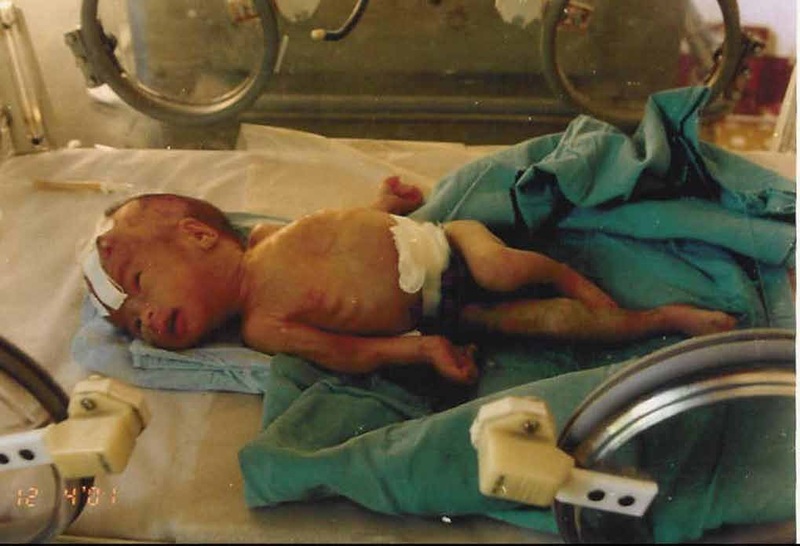 Her legacy is safer care for neonates and nurses practising more holistically. Click here to read about her experiences. 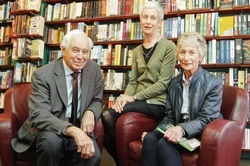 REMEMBERING THE DAYS: Surgeon Michael Shackleton with his wife, Annabel, and their daughter, Anna Hunt, reflect on the time they spent in Vietnam during the war. 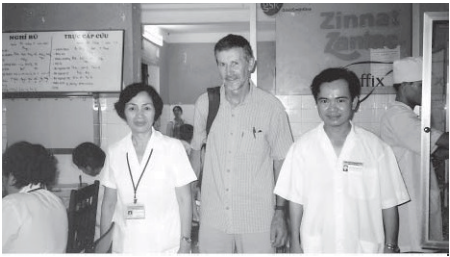 ​Dave Peddie in Vietnam: "There is not a lot of spare money in Vietnam to be spent on health, and many things we take for granted here just do not exist"
"I would estimate less than 10% of women over the age of 25 would have ever had a pap smear. As a result there were not a lot of women with abnormal smears coming through to assess. In the few I saw with an abnormal smear there was a high rate of high grade or malignant change." NZ VSA volunteer Dave Peddie spent four weeks in Binh Dinh Province. During his stay Dave was based in Quy Nhon, at that time a city of about 250,000. “This trip was my first experience of third world medicine and probably the most interesting four weeks I have had at ‘work’ since graduating in 1969. The project I was involved with (No 126 in the list of NZVNHT projects) was to do with women’s health and, more specifically, cervical cancer screening and cardiotocograph [CTG] monitoring in labour wards. Quite a number of New Zealanders, including some from here in Christchurch, have been working with these projects for a number of years now. While I was there I hoped to gain some idea what was happening and of where possible improvements could be made in cervical screening. There were opportunities for colposcopy teaching and I was also able to visit labour wards to review the use of CTGs. In four weeks it was only possible to scratch the surface of what is a reasonably complex health ‘system’. There is not a lot of spare money in Vietnam to be spent on health, and many things we take for granted here just do not exist. There is no real primary health care in the towns and cities, so every day at the District and Provincial Hospitals start with a ‘scrum down’ of people hoping to gain access to a limited resource. It is a completely different environment, physically and clinically, for obstetrics and gynaecology, from what we are used to in New Zealand. I was there in early summer, when temperatures were up to 42C. Trying to teach colposcopy through an interpreter in a small room with two examination beds and patients, and up to six doctors and nurses, was a challenging but enjoyable experience for me. Read more about Dave's experiences.